This is a story of how Auditel became an Auditing Telecommunication Company. In the early 90’s, I was in the long-distance business, and one of our clients was Gooding’s Supermarkets, a Florida-based grocery store chain. However, while reviewing their telecom bills I noticed there were no usages billed on 30 phone lines. The telecom vendor thought the phone lines were in use, but I could find no usages of on any type on any of their bills for the past 10 years, so I requested a site visit. Meanwhile, the service provider and the vendor spent the entire day trying to locate the 30 PBX lines. However, it turns out the lines had never been delivered to the site. Unfortunately these 30 lines had been billing for the past 10 years! We obtained a refund back to the service established date, plus interest. It was a sizable refund, and I knew right then that I was on to something. I started Auditel and haven’t looked back. After the findings, Gooding’s hired Auditel to oversee their telecom department. Then came the bank branches inside the supermarkets. Each used our telecom audit services for saving and telecom recovery. And that’s how the Auditel journey began. One client to the next this continued as I realized how much I enjoyed finding mistakes in phone and data billings. I could hardly believe how many telecom bill errors there could be inside phone, wireless and data bills. As the news traveled we began getting requests for telecom audits from many companies. Clients like Florida Hospital, Rotech Medical, Sears Pest Control, Airgas, 1st National Bank, Rent a Center, the Orlando Sentinel, Pier1Imports, among others who benefited from our training. It was truly amazing to be working with Fortune 500 Companies in our first years of business. As we expanded over the years, I developed a telecom training curriculum. Our telecom training brought executives, IT Managers, telecom analysts, and accounts payable the telecom expense management tools and process to analyze Service Providers taxes, surcharges, fees, contracts, and USOC codes. With our GSA schedule we trained several divisions of the U.S. Marines, and The National Weather Service. Auditel began training companies like GMAC Insurance, Southern Company, RentWay, EchoStar (now Dish Networks) and many more of our clients who can’t be named due to confidentiality and NDA. In summary, Auditel began with a telecom refund at Gooding’s and ended up starting the foundations of Auditel an auditing telecommunication company. So, now thanks to our clients, for over 25 years we’ve delivered telecom audits,inventory management, telecom training, and contingency based telecom expense management TEM and bill cost reduction solutions. ”Many of our clients tell us “If you want more than TEM and telecom software, you need Auditel”. 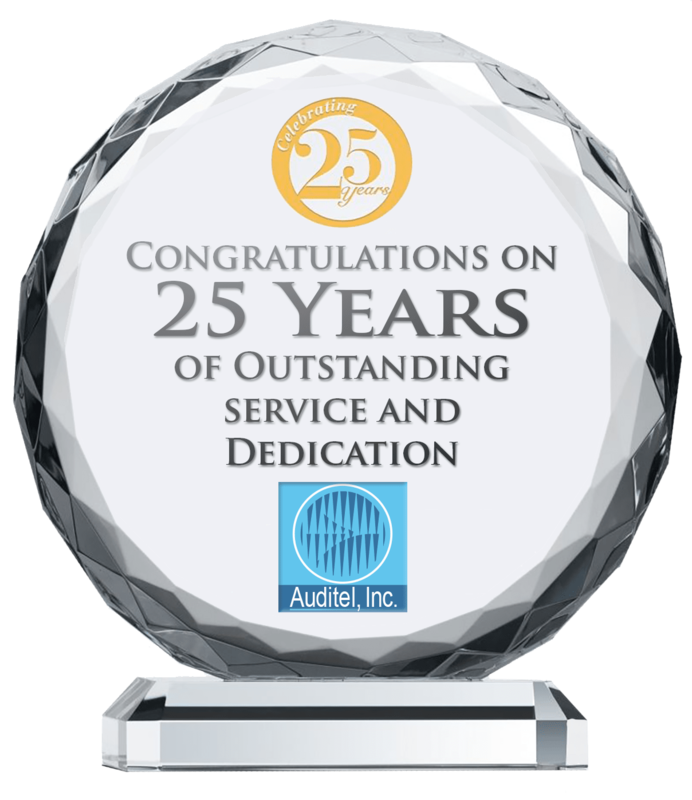 You can view this Press Release: Auditel Inc. over 25 Years Later online. But, at Auditel customer service is the key element to our success. We always put our customers first and want each customer to feel like they are the only one. With over 25 years in business, having 99% of our clients obtaining a refund, we continue to exceed our customers expectations.